On October 22nd, Apple announced updates to some of their products. Along with the release of OS X Mavericks, their latest version of their desktop operating system, they also announced new versions of iLife and iWork applications for iOS, OS X, and iCloud. New MacBook Pros were also announced. The expected items, though, were a pair of new iPads. The iPad mini was given a much needed Retina display, while the full size iPad was upgraded and became the new iPad Air, a thinner and lighter 9.7″ iPad. Both of these updates were expected due to news leaks over the past few weeks and were welcomed with open arms. However, there was a bit of a surprise when it came to what the new iPad line-up now consisted of. Both of those new iPads would be the premium product, while older versions remained on sale. That has been Apple’s MO with iPhones and iPads for years. Yet, while last year’s breakthrough iPad mini made sense to keep in the line-up, the iPad 2 seemed out of place. Why would Apple keep selling this 2.5 year old iPad, one that doesn’t even use the latest Lightning connector? Second, by leaving the iPad 2 in the line-up, it gives consumers an option for an iPad that still supports the 30-pin connector and the massive amount of accessories that were created for that connector. But is this a big enough reason for people to buy an iPad 2 when, for $100 more, they can get the new iPad Air? The iPad 2 was great when it was released. But lacking a Retina display and still using the old 30-pin connector (plus the A5 chip that doesn’t keep quite up to speed with its modern breathren) makes it a poor choice from the current iPad line-up. 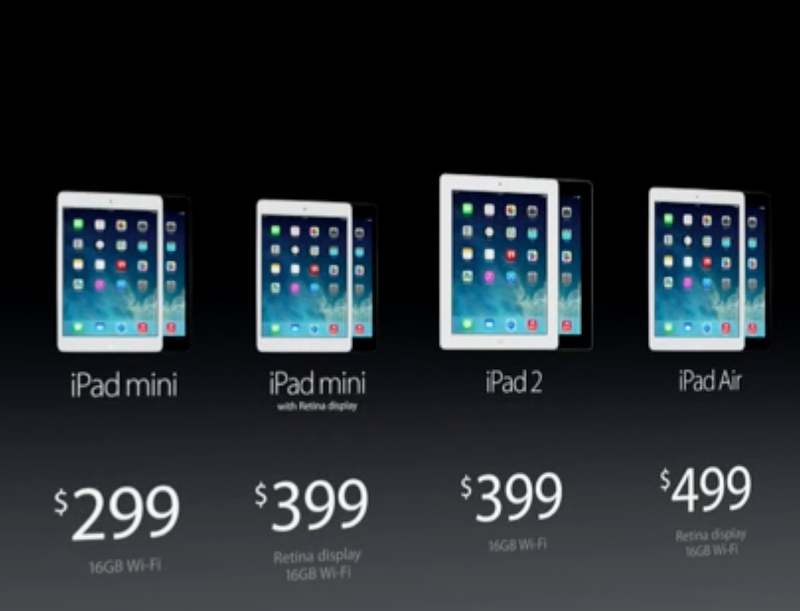 For identical specs, you can pay $100 less and get the iPad mini. The screen may be smaller, but you’re getting a thinner form factor AND a device with more functionality2 than the older iPad 2. 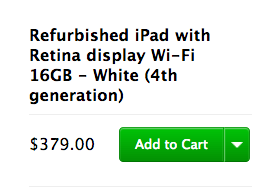 Add to this the fact that, on Apple’s own website, you can find refurbished 4th generation iPads available for $379. Yes, you can get a newer iPad from Apple’s own website for less than the iPad 2. But if newer models can be purchased for less than $400, why would you want to buy an iPad 2? You can get a newer iPad straight from Apple for less than a new iPad 2! This is why I say you shouldn’t buy an iPad 2. If you have the $399 to spend on it, why not get a newer model? Even the next newest model, the 3rd generation iPad, had a Retina display. While you would still be sporting the larger connector and an older body style compared to the iPad Air, you’d also have a capable tablet with a higher resolution screen. Even if you don’t buy an iPad 2, however, there’s reason to be happy Apple still sells it. Why is that? Don’t you hate buying a product when, months later, it seems like your relatively new purchase is obsolete? Thankfully, while Apple continues to iterate and innovate with hardware, much of the capabilities of their devices come from within the silicon. iPhone 3G customers may recall a time when their iPhones could not do the now common task of copy-and-paste. Yet, a software update (iOS 3) brought that feature, and others, to their iPhones. They may not have had the latest processor or camera specs, but those iPhone owners were able to get improved use from their devices. Similarly, Apple has a fairly good track record of supporting older iOS devices. And each time Apple continues to sell an older generation model,3 they also permit the latest iOS software to run on it, albeit with some features likely not supported.4 When the iPhone 4S launched, iOS 5 was also released. The iPhone 3GS, still being sold at the time, was able to get that software update. Neither it nor the iPhone 4 had the ability to use Siri. Yet, each phone still found extended use by its owners.5 Likewise, when iOS 7 was announced this past June, Apple was still selling the iPhone 4. iOS 7 was installable on those older devices, even though Apple removed them from their line up at their iPhone event in September. The iPad 2 may not be the wisest choice for buying a new iPad. Yet, the fact that Apple is still selling it means that, quite likely, unless new iPads are announced in the spring, the iPad 2 could possibly support iOS 8. Even if it doesn’t, there’s a good chance the third generation iPads and newer will support it. And as iPad and iPhone hardware matures, it’s likely we’ll see more and more generations of iOS devices supporting newer versions of IOS. They may not have the hardware to support all of the latest features6, but they’ll remain up to date nonetheless. But for any iOS device owners who have purchased an iPhone or iPad in the past 2 years, you’ll be okay using your device for at least another year with updates galore. If Apple will support a device from March 2011, yours should be supported, too. Next: Next post: What Will Apple’s iWatch Be?